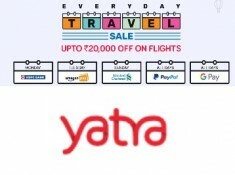 Book domestic flights and hotels on Yatra and pay with Google Pay. This instant discount offer is valid for first transaction on Yatra with Google Pay using YTGPY. To avail the offer, customers must opt for Google Pay UPI ID as the payment option on payment page and complete the payment. This offer is valid only for online confirmed bookings and selected domestic hotels. Claim your scratch card reward 30 days after your transaction is successfully processed. The offer is valid till April 14, 2019.